Hearing Sound of Pine Trees (听松,Ting song, Erhu, 二胡), Erhu Solo (二胡独奏曲), was composed by A Bing (阿炳), whose real name is Hua Yanjun (华彦钧). 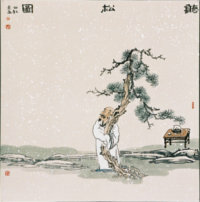 The Moon Reflected in Er-Quan (二泉映月, Er Quan Ying Yue , Erhu, 二胡) is also composed by him. Enjoy Hearing Sound of Pine Trees (听松,Ting song, Erhu, 二胡) in your browser now (just click the Play button below). Listen more Erhu tunes? Back to Erhu(二胡) page.